With 360° infrared(IR) coverage, you can place Sensy Remote anywhere in the living room and relish a relaxed TV experience. Along with Sensy Remote, the Sensy app can change channels on your TV. Sensy Remote uses Bluetooth Low Energy to listen to your phone, and then transmits Infrared signals to your TV/STB. No need to memorize channel numbers. Automatically updated from the cloud. What is Sensy Remote? Is it a new Set-top Box? Sensy Remote is not a set-top box; it's a small box that you place in your living room, that then allows the Sensy App on your smartphone to control your existing set-top box - hence turning your phone into a smart remote. Technically, it is a Bluetooth Low Energy (BLE) to InfraRed (IR) Bridge. Through the Sensy App, you can browse and discover TV content on any channel in any language across India, through a beautiful, rich, graphical and voice enabled interface. With the help of Sensy Remote, you can then switch to a chosen channel directly from within the app, irrespective of the operator (be it Airtel, Tata Sky, Den, whoever). You never again need to remember a channel number, ever. The Sensy App communicates the required channel number and other information automatically to the Sensy Remote via BLE, and Sensy Remote in turn blasts the required IR codes with the operator-specific protocols (like your old remote) to control the set-top box. Which set-top boxes are supported? Should I buy a different Sensy Remote for every TV Operator? Sensy works with practically all InfraRed-operated set-top boxes / operators in India - Airtel DTH, Tata Sky, Videocon (Non RF versions), Dish, Sun Direct, Reliance Big TV, Den, Hathway, In Digital, All Digital, GTPL, FastWay, SCV, ACT etc. One exception are the RF-controlled STBs supplied by Videocon, which we do not support. If we are missing an operator's STB, let us know at [email protected], and we'd be happy to add it. Again, adding STB support is only in the app, no change is required to the Sensy Remote device; so it would support newer set-top boxes as well. The setting of the operator is done on your smartphone in the App, so needless to say, the same Sensy Remote works with any STB from any operator. Do I need Sensy Remote to use the Sensy App? 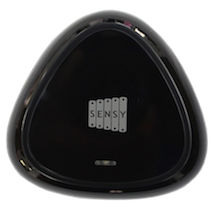 You can use the Sensy App independent of the Sensy Remote device. The app is free and can be downloaded from the Play Store or the App Store. 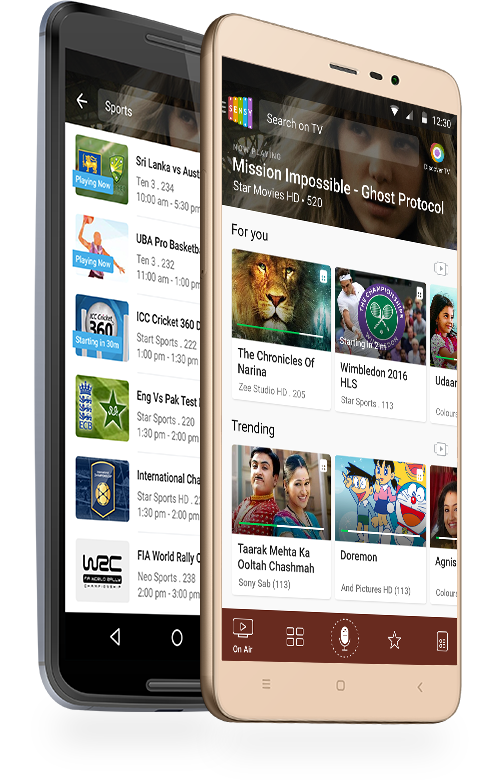 With this you get all the beautiful, rich TV and related content discovery that the app has to offer across all channels and languagues across India. The Sensy Remote device helps you further to change channels directly from within the app, thus doing away with your old remote altogether. If you have a phone with an infrared emitter, you can still change channels from within the app without even needing a Sensy Remote. The app automatically recognizes the IR capabilities on your phone and enables the remote features. The following phones are tested for using the in-built IR for remote functions: Samsung S4, S5, S6; HTC One M8, M9, Xiaomi Mi4, Mi5, Redmi Note 3; LG G2, G3, G4; Huawei Honor 7; and many others. Note: This doesn't work on all phones with IR, due to non-standard IR APIs used by the phone manufacturers. For example, the Honor 6 uses non-standard APIs which are not published and hence the Sensy App (or any 3rd party app) cannot use IR on that phone. How is Sensy Remote powered? Sensy Remote runs on 2 AA Batteries. You can leave the device on even when not in active use. We expect the batteries to last close to a year. Oh, and by the way, we ship the device with batteries the first time. Isn't it nice to just switch on and get it to work right away? No. A Chromecast makes your dumb TV smarter - and allows you to 'cast' content from your phone to your TV. Sensy Remote makes your dumb set-top box smarter - and allows you to 'command' your set-top box from your phone. Is this outsourced or made by you? This is designed and manufactured by Sensara. And very much Made in India, by a team that can speak Kannada, Tamil, Malayalam, Telugu, Hindi, Tulu, Konkani, and even Sanketi. If you think your region is not represented, we are hiring!